Conduct a flight from Bakersfield Meadows Field (KBFL) to Mojave Airport (KMHV) and obtain VFR Traffic Advisories prior to departure. Learn how to obtain VFR Traffic Advisory Services prior to departure. Fly from KBFL to KMHV. Prior to departure pick up traffic advisories to KMHV. Inform ATC on initial contact at KBFL that you are performing the CAT-6 Rating. Both KBFL and KMHV are located in Class D airspace. Prior to operating in Class D airspace you must obtain two way radio communication with the control tower. This is done by calling the control tower and having the tower reply to you with your callsign. SUA is airspace where specific activities are conducted that need to be contained due to their nature. Normally these activities are military in nature. The first type of SUA you will encounter during this flight is a Military Operating Area (MOA). MOAs are used for military training operations. Specifically, air combat tactics, air intercepts, aerobatics, formation training, and low-altitude tactics. MOAs are not always used and can be either active (sometimes referred to as hot), or inactive (cold). There are no restrictions on VFR flight through a MOA, however it is highly recommended to either avoid active MOAs or obtain advisories when transiting the MOA. MOAs are depicted on VFR charts in a magenta hashed line and are named. 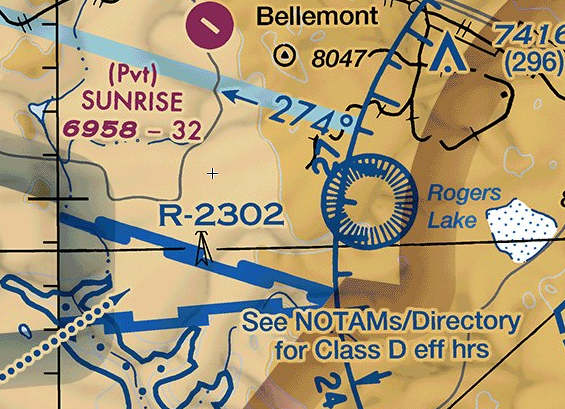 We will be flying within Bakersfield MOA and then the Isabella MOA, More information on MOAs to include altitudes, active times, and controlling agency (ATC facility which can provide information about the MOA) are available on the side bar of VFR charts. 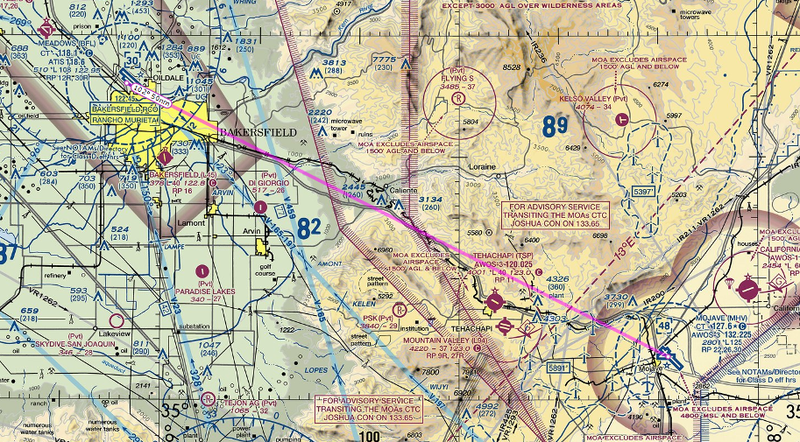 For our flight the Bakersfield MOA starts at 2000’ AGL and ends at 18,000’ MSL (which is the normal ceiling of MOAs). It is only active when a Notice to Airman (NOTAM) is issued. The Isabella MOA starts at 200’ AGL and ends at 18,000’ MSL. It is active on weekdays from 6 AM to 10 PM Local. The Mojave airport is located within this MOA so there is no way around it for us. Also near our route of flight is restricted airspace. Restricted airspace is airspace where military activities are conducted which are dangerous to non-participating aircraft, including weapons firing. VFR aircraft are not allowed to enter active restricted airspace without ATC clearance. There are no restrictions on transiting inactive restricted airspace. 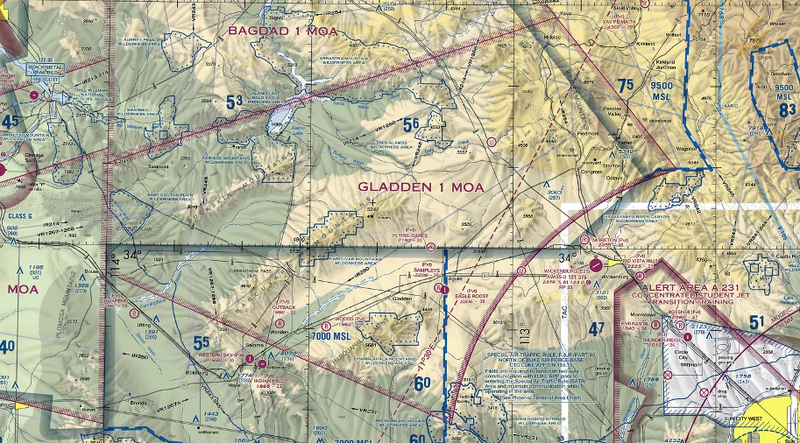 Restricted airspace is depicted on VFR charts in a blue hashed line and are numbered with a number starting after an R.
Just east of the Mojave airport is R-2515. R-2515 exists from the surface to unlimited and is always active. Fortunately for our flight we do not need to transit the airspace. There are several other types of special use airspace that we won’t encounter in this flight but should be familiar with. Prohibited airspace exists around specific locations which need to be protected for national security reasons. Prohibited airspace is depicted in a blue hashed line (similar to restricted airspace) and are numbered with a number starting after a P. Aircraft cannot enter prohibited airspace. Alert areas exist around locations with a high volume of training traffic. Alert areas are different from MOAs as there are no abnormal operations within an alert area. Alert areas are depicted in a magenta hashed line (similar to a MOA) and are numbered with a number starting after an A. There are no restrictions on operating within an alert area. Warning areas exist offshore around locations where hazardous activities are conducted. Warning areas are different from restricted airspace in that they are located in airspace where the FAA cannot regulate the operation of aircraft. Warning areas are depicted in a blue hashed line (similar to restricted airspace) and are numbered with a number starting after a W. There are no restrictions on operating within a warning area. Controlled Firing Areas are locations where ground based weapons testing is done. During these operations a spotter is present to look for aircraft and operations are not conducted when aircraft are present. Controlled Firing Areas are not depicted on VFR charts. We pray, then, that the spotters are really, REALLY good. National Security Areas are locations where there is a requirement for increased security and safety of ground facilities. National Security Areas are depicted with a thick dashed magenta line on VFR charts (note that most are very small and end up looking like a magenta blob). Pilot’s are requested to avoid overflying National Security Areas but there are no actual restrictions. VFR Traffic Advisories (commonly known as flight following) is a radar service that is provided by Air Traffic Control facilities for VFR aircraft. Flight Following provides VFR aircraft with radar traffic information. Flight following can be requested on the ground at a towered airport prior to departure or after takeoff. For this flight we will pick up flight prior to departure. Flight following can be requested from the ground at certain airports. Generally larger airports are equipped to provide flight following services for departing aircraft. At smaller airports you may or may not be able to request flight following prior to departure. There is no way to know ahead of time is this service is available. If you desire flight following, request it prior to departure (as explained below) and the controller will advise if they are unable to provide it. In this case you can still pick up flight following after departure. At airports with a clearance delivery frequency you will generally request flight following on the clearance delivery frequency. In your request include your destination, type aircraft, and intended cruise altitude. You should also include the ATIS code. Clearance delivery will reply with a departure frequency, squawk code, and in certain cases departure instructions. Read back these instructions, and then contact ground when ready to taxi. At airports without a clearance delivery frequency this call should be done on the ground frequency. You can either combine this request with your taxi request or request flight following prior to taxi. In either case you will get a departure frequency, squawk code, and possibly departure instructions. Switch to Bakersfield Departure on 118.80. When 10NM From KMHV expect approach to hand you off to tower.